Storage and changing facilities are a vital component in hospital refurbishment work and are expected to provide practical storage areas, and to comply with the stringent health and safety standards. 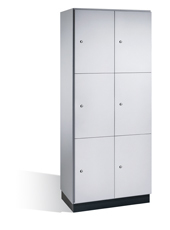 That’s why many UK hospitals turn to CP Lockers to help them design and implement the high standards storage solutions that are known in the sector for their practicality, their ease of access, as well as their quality and reliability, irrespective of the size and other restrictions of the changing area. 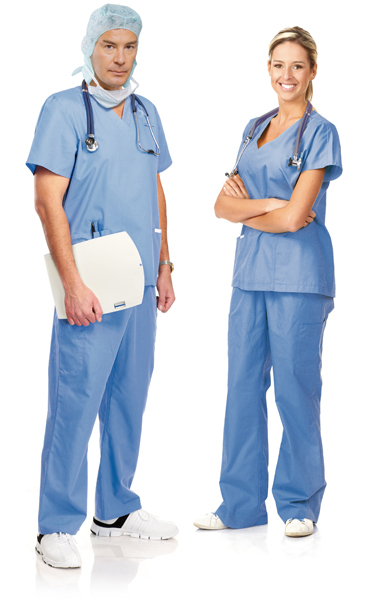 Clinic and hospital fittings must meet very high standards of hygiene, especially in intensive care, the operating theatre or the quarantine area. One of the requirements is the resistance of the furniture to disinfectants. 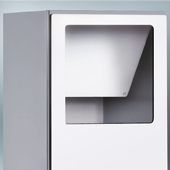 PREFINO offers more: Smooth interior and outside locker walls make cleaning and decontamination child’s play. The zinc-plated steel carcass with its annealed coating offers additional benefits in terms of hygiene and cleaning. 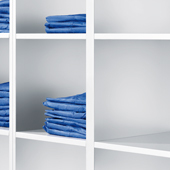 Internal and external corners that fit perfectly ensure that the lockers systems have clean ends. Smooth Interior Walls: All of the interior walls are uniformly smooth – making them convenient to use and easy to clean effectively. A further issue that hospitals need to address is the provision of fresh laundry and the handling of dirty laundry. 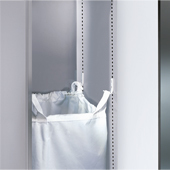 Here, again, Prefino has just the right products – from shelves for issuing fresh laundry right up to laundry collectors with swing deposit flap and telescopic pull-out for the laundry bag. The range is completed by matching box lockers. 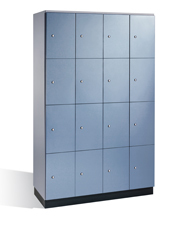 Box Locker: Three lockers on top of each other, two lockers next to each other, compartment width 400 mm. 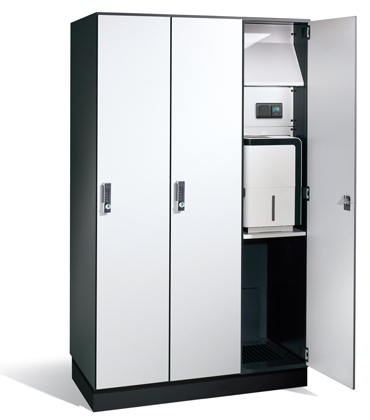 Box Locker: Four lockers each on top of each other and next to each other, compartment width 300 mm. Laundry Collector: With HPL door, upper swing flap and laundry bag holder on the inside. Swing Flap: For easy loading of the laundry collector. 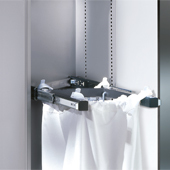 Laundry Bag Holders: The standard version has four sturdy retaining hooks (centre picture); a convenient holder with telescopic pull-out is also available for easier removal of the laundry bag. 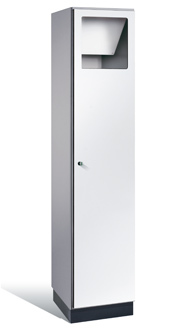 The requirements placed on locker systems used in hygiene areas (e.g. in the food industry) are particularly stringent – in much more than just one respect: For one thing, the surfaces must be smooth and easy to clean. The steel carcass with smooth interior walls gives Prefino a clear edge. Another aspect is the connection of existing ventilation or extraction systems, which needs to be resolved professionally. Added to which, suitable add-on products are needed, such as swivel benches for the staff to move from the “unclean” to the “clean” area. CP has just the right range for solving these fitting challenges. Technology Compartment with Dryer: The sizing of the drying and ventilation system is dictated by the local conditions and the drying tasks that need to be performed.